They reside in the darkest depths of the world's oceans. They only venture out to hunt for food. ABYSSQUEEN often swim near them. Why they do this is unknown. 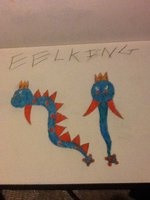 EELKING are extremely territorial, sometimes attacking ships that get too close. It is said that where schools of HUNTAIL are found, EELKING is always nearby. They are often seen with ABYSSQUEEN. It was once thought that EELKING were long extinct until a group of researchers discovered one in the darkest depths of the ocean. The club on their tail is used to fight for a mate. For some reason, the only thing able to calm down an angry EELKING is an ABYSSQUEEN. 1-Hit KO. The user brings water down upon the foe with the force and pressure of the ocean abyss. By exercising its royal powers, the user doubles its Defense and Sp. Defense stats. By exercising its royal powers, the user doubles its Attack and Sp. Attack stats.